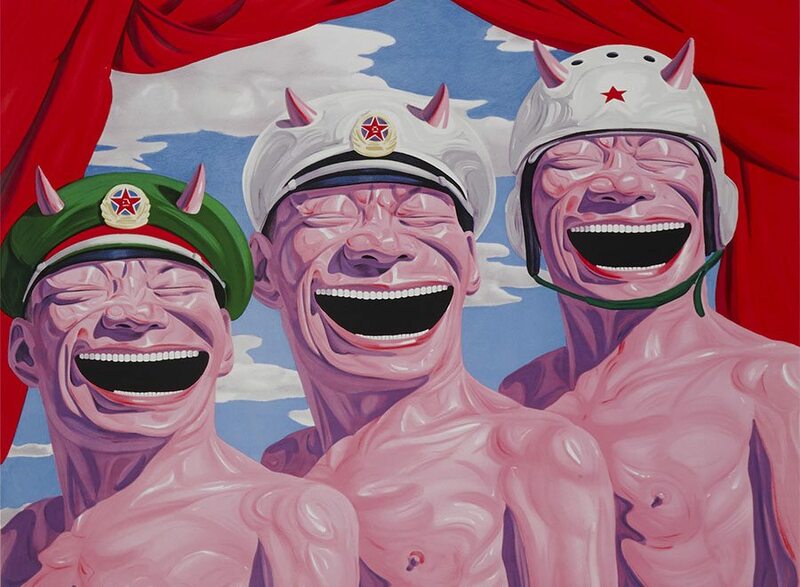 If one had to summarize Yue Minjun’s style in one word, it’d have to be “laughter”—but Yue would probably rather not be condensed into one word at any point in time. Known for depicting these exaggerated self-images, donned in jaw-breaking grins, across different contexts and mediums, Yue has been hailed as an icon of the Chinese “cynical realist” movement. This piece, “Armed Forces”, depicts three of his typical selves, frozen in a state of maniacal laughter, this time with assigned uniform hats to differentiate them. Presumably, each of them plays a separate role in the Chinese armed forces, yet their uniformity hovers over the entire affair. The horns sticking out of their respective hats also seem to incriminate them in some way. Yue’s entire oeuvre testifies to a remarkable courage to tackle political and social contexts with a certain comedic air. Almost effortlessly, he takes a pervasive human gesture and endows it with different meanings across a variety of contexts. Sometimes, the laugh seems only to indicate pure joy. Other times: some form of mockery. Here, their smiles should perhaps be observed in conjunction to China’s Cultural Revolution, which Yue has addressed directly in several of his works. There seems to be something stiff about each figure’s smile, perhaps a sort of masked helplessness. The contrast he employs on the skin of the figures, stronger than his usual painting, gives them plastic texture. In this way, the smiles almost seem tragicomic. Through this simple motif of his, Yue manages to recast a universal emotional expression to which we are ever-so-habituated in a different light. He manages to keep it completely intact and yet steer the look from its usual meaning (comedy) to its antithesis (tragedy) through simple artistic maneuvers. Yue’s art manages to cross cultural chasms showing that behind laughter there can be despair, anger and sadness and even helplessness. What emotions are behind your smile? This is a really unique style – this piece gave me a chill when I first looked at it. I love this idea of challenging the meaning of laughter here, as artists like Yue place it into different contexts that completely turn such a universal action on its head. I think it’s definitely what Yue seems to be going for, especially with the satire involved. Well done!